Cottage cheese is a cheese curd product with a mild flavor. It is a convenient food perfect to eat out of the carton or in salads, or to use for baking. It is a favorite food among bodybuilders as it has a high content of casein protein while being relatively low in calories. It is considered a good diet food. It doesn't matter whether you choose large or small curd cottage cheese, but you should select reduced-fat or fat-free to reduce the calories and saturated fat in your diet. Losing weight requires that you reduce your calories so that you eat less than you burn; a good diet food helps fill you up without adding too many calories. The energy density of a food is the amount of calories in a serving of that food. 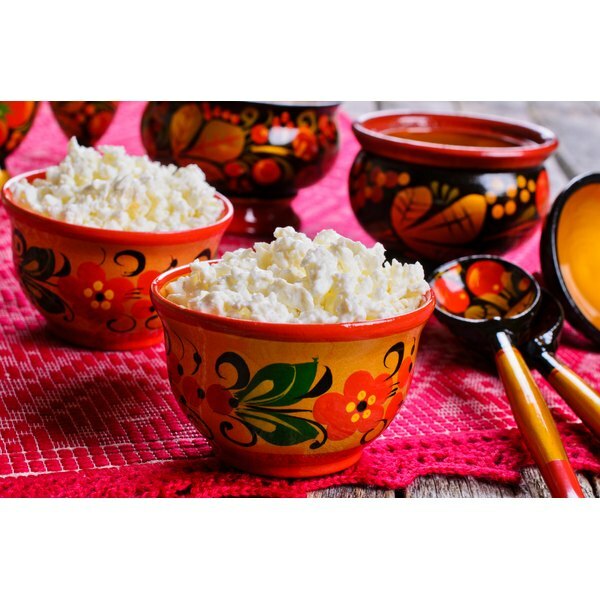 Reduced fat and fat-free cottage cheese are low energy-dense foods and can be good for a reduced-calorie diet. Regular cottage cheese has 113 calories per 4-oz. serving, while the same portion of nonfat cottage cheese has 82 calories. It makes a good snack alone or with some fruit or vegetables, or you can have it as part of a light meal with a salad or on whole grain bread. A 4-oz. serving of fat-free cottage cheese contains only 5 g of carbohydrates, 4 of which come from sugar. Cottage cheese can make the basis of a great high protein, low carbohydrate lunch or snack. The flavor goes well with fresh vegetables, such as peppers, or with fruits including pineapple, peaches, or berries. A 4-oz. serving of cottage cheese has about 13 g of high-quality protein with the essential amino acids you need to get from your diet, according to the Harvard School of Public Health. Cottage cheese is lower in calories than a lot of other good protein sources. It also provides almost 10 percent of the daily value for calcium, an essential mineral for strong bones. Sodium does not provide calories, so it does not affect your weight, but a high-sodium diet can increase your blood pressure. Cottage cheese has about 411 mg sodium in a 4-oz. serving, and the 2005 Dietary Guidelines from the U.S. Department of Health and Human Services recommends that healthy adults limit sodium to 2,300 mg per day. A healthy diet does not exclude or rely heavily on any individual foods or food groups, so a moderate amount of cottage cheese can probably fit into most healthy diets.